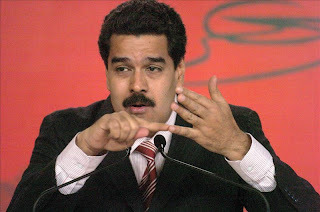 Foreign Minister Maduro counting possible reasons for his demise...1..2..3..4? 1. Maduro was becoming too big of a domestic shadow for a paranoid coupster like Hugo Chávez who has always been mindful of 'chavismo without Chávez' maneuvering. 2. Maduro was being trumpeted as successor by too many foreign governments (i.e. Brazil, Cuba, Colombia..) that have assumed as 'sincere' his behind-the-scene bad mouthing of Chávez: "it is so difficult to work with him...he is nuts...let me see how we can make him understand" ... and so on. Chávez, this version states, was able to see during CELAC's Summit that Maduro was in cahoots with others holding court as the anointed one. Remember this instant-falling-out-of-favor happened a decade ago to Cuba's Roberto Robaina, and more recently to Carlos Lage and Felipe Perez Roque. It would not be surprising if Cuban intelligence reported on some of Maduro's most egregious badmouthing and grandstanding. 3. Maduro and his partner, former National Assembly President, Cilia Flores (also apparently fallen from grace), where allegedly outed by Walid Makled, the much talked about drug kingpin the Colombians returned to Venezuela after months of debriefing by US Government agencies. According to this version, Makled supposedly gave accounts of the activities of the powerful couple who - according to him - controlled their own little segment of the narcotics trade out of the Port of Puerto Cabello (in Carabobo State by the way). According to Makled, one of Maduro-Flores containers was reportedly captured by the DEA in Cartagena, Colombia, on the way to Mexico containing something other than the bathroom fixtures it was said to hold. Those pushing this theory say that Chávez was made aware by 'a third country' that Maduro and Flores were being closely tracked. 4. Maduro is still the "successor" and the announcement of his demotion is nothing but a ploy by mentally perturbed and physically impaired Hugo Chávez. Blogger Miguel Octavio discusses this case in his latest post.